This section contains information related to Air Baltic, flight code BT, a low-cost carrier full-service type. Click a link below to jump to the related paragraph. Air Baltic Corporation (airBaltic) is a stock company that was established in 1995. Major shareholders include the Latvian state, with 52.6% of shares, and SAS AB, with 47.2% of shares. 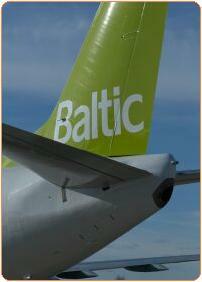 In 2005, airBaltic carried 1.04 million passengers. The airBaltic fleet currently consists of sixteen aircrafts - seven Boeing 737-500s and nine Fokker-50s. Click to view their company history in a new window. Click to browse to the network development section of this site, featuring more more information on the network development of Air Baltic.